Computer renderings and not models. The majority of the work should be the basis of physical exploration. Not computer rendering. Why should the motor be part of this when they operate autonimously…….. 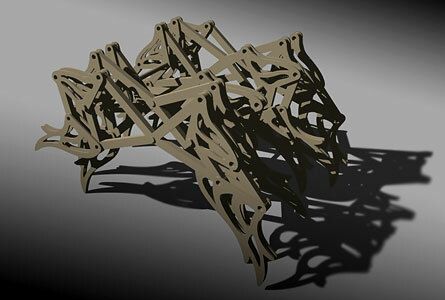 The legs, legs are braced in three dimensions for lateral stability. Still working in 2.5 dimensions. Legs on the wind structures are in 3 dimensions. His work also pays remarkable attention to details. The plastic conduit pipe plays a critical role in his work. Really understands the limits of the materials. If it remains a diagram it has no physical properties. Garret Reitveld: walking cradle from the 1920’s. Manitoba (too flat)is interesting because something could be made as it moves across the prairies. if there is snow and it is soft, then the legs need to be designed to spread the load. at the same time can’t be too light because it will be blown away. It just takes too long to make a moving model. To figure how the final product looks like, and what kind of technique I should do, I uesd 2mm thick millborad to make this model, which pretty much has the same thickness with the hardboard that I am going to use for final model. The board is hard enough to make a strong model, but it just to hard to cut it in shapes by hand, and takes so much time to do it. It pretty took me a day to just make this portion, despite the model works very well. I was thinking added the wings on the legs, so when the spider walks then the wings spread. 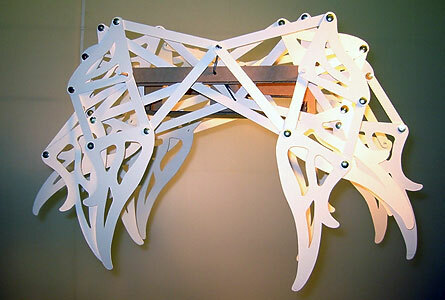 However, it seems I have to redesign the mechanism of the wings again. I also simplified the shape of the legs, but still like the previous design better. Materiality: Although I used thick peper card to make this model, but it still seemed flimsy. Mechanism: Since I want to make this structure walks more like a spider, so I altered the mechanism to exaggerate the movement of the legs. 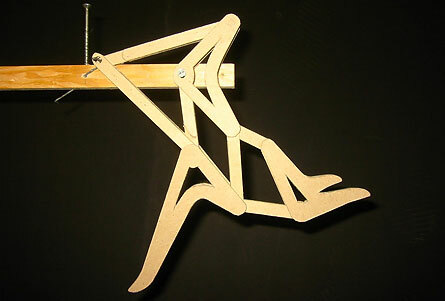 However, I extended the rotating arm too long, which makes the legs stuck when they swing back. 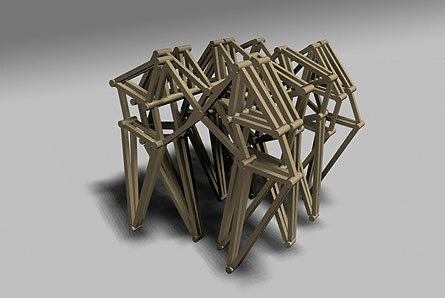 Craftsmanship: I thought this is just an experimental model, so I did not cutted the components precisely. In conclusion, on next stage, I will use proper materials to do the work, and work more precisely. Since I adjusted the mechanism to achieve the movement of arthropods, so I made this model to reconfirm the structure works and see how it runs. This is how the final product looks like in this phase. An oval panel in middle for placing the batter pack, motor, and gear set. Three sets of legs on each side, so overall the spider has 12 legs…… (WHAT! does a spider has 8 legs?) because of the balance purpose. Now the problem is that I am afraid the whole structure still too heavy and linked with so many joints, I wonder a battery motor powerful enough to operate the spider. I might going to adjust the form to reduce the weight a little bit, or maybe I can use different materials such as thiner hardboard instead of 3mm thick MDF. Since I am going to use laser cutter to manufacture the form of my structure instead of just use wood sticks, I decided to stylize the shape of every piece of the components. With the laser cutter I can make the structure more professionally and precisely. 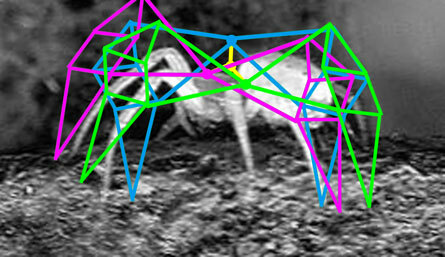 Ideally, the shape is based on the spider’s leg (e.g. representing the thorn or hair on spider’s legs), and to make it more machine-like. 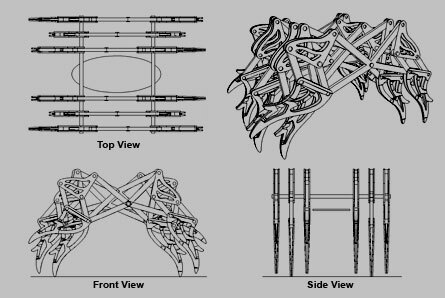 Also the purpose of the design is to reduce the weight of whole structure as much as possible, since I am still want to use battery motor to operate the robotic spider. Spiders are the very interesting creature, though many people confuse spiders with insects. Spiders and insects both belong to the phylum arthropoda in the animal kingdom, but spiders are arachnids and hey eat insects. To distinguish them that Arachnids have eight legs and two body segments, but Insects have six legs and three body segments. 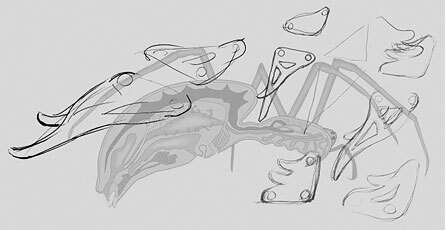 With same principle I break down the structure of spider’s legs into geometry forms, and alter the function of mechanism a bit to expand the movement of the structure. I feel that it is more difficult to imitate the movement of bugs than to mimic the walk of large of large animals. So based on Theo Jansen’s theory, I am going to make a “Robotic Spider”, which would be powered by battery motor. 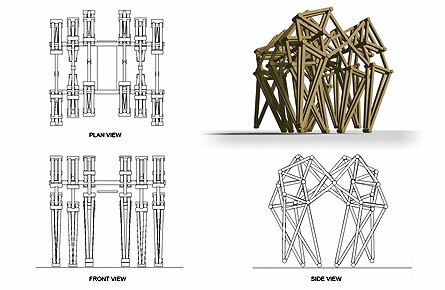 The renderings just showing the basic concept what the structure of the spider would be. I am still adjusting the angel of the legs, to make them walk more like a spider. Materiality is a big issue here because I was thinking using wood to build the skeleton, but what kind of material is proper to make the joints, and how to make the them rolling smoothly would be the hardest part of this project.